First of all, thank you so much for all the love on Mr. Relish's man quilt! I think I replied to over 60 comments! Wowza! That was a fun little blog hop and hope to do more! I have some paper piecing to share with you today...yay! My sis-in-law and her family moved to India this past spring for a missionary trip and I am just now sending them a care package. I had meant to send one much sooner but got a little side tracked while my dad was in the hospital. I wanted to make something special for the kids (7 & 4) but knew I could risk sending entire quilts there. Packages are known to go missing or "accidently" opened during their journey. So I decided to make them minis that could be used as a pillow or a wall hanging. 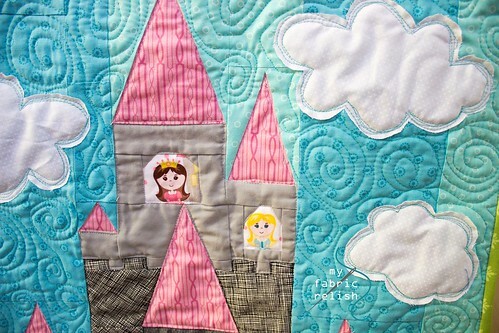 I used Blossom Heart Quilt's brand spanking new paper piecing pattern Fairy Tale Castle and added adorable princess fussy cuts for the windows. I don't remember where I got this fabric but it was perfect. I tried to go scrappy with the sky but it still turned out a bit boxy. I think the swirl quilting helps alleviate that (for me) and then added raw edge appliqued clouds and FMQ those on. I am so in love with this pattern and need to make another one for my girls. I'm surprised big relish didn't try to claim it as hers. I guess she didn't have a chance because the moment they were finished and photographed, they were pack into the box. Next up is R2D2! My nephew is a huge Giant GINORMOUS Star Wars fan, so of course I had to do one of Quiet Play's Star Wars paper piecing patterns. Oh, and did you know they are free! It was easy to pick R2D2 and then I asked Mr. Relish to pick out the background fabric. He did a great job, it looks just like outer space! I again raw edge appliqued a moon by FMQ and then did the same swirl effect. 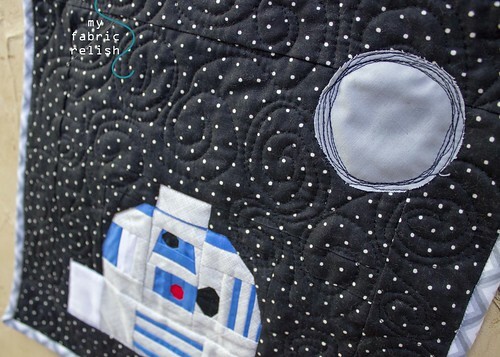 There are a few hidden stars in the quilting, too. I wanted to try that FMQ technique on this one but didn't want to make a mess of something that was a gift. I also put in some fabric baskets for my sis-in-law and then some other little things for the kids. I really hope this package makes it to India safe and sound...wish it luck on its journey! I will be linking up over at Quiet Play, Crazy Mom Quilts and all my other favorite parties to the right! What fabulous gifts. I'm sure they will be much loved. I might have to have a go at the r2D2 one myself, my hubbie is a big Star Wars fan and this would definitely make a great gift for him. Thanks Paula! The R2D2 is a quick one to whip up! I bet he would love it. My hubby thought it was pretty cool. Thanks for stopping by! Both of these mini/cushion quilts are amazing! Your niece and nephew will be thrilled! What a great aunt you are, Melissa. 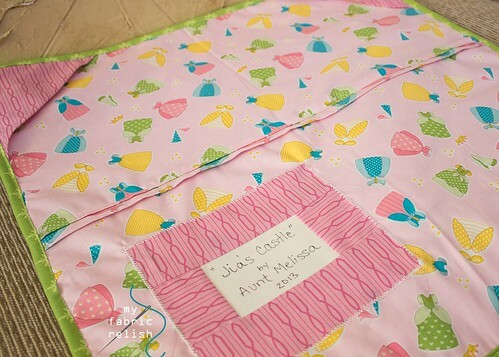 Sew sweet of your to share your quilty goodness! Thanks so much, Lorna! You are too sweet to say that! I really hope it makes it there and they get to enjoy them. Have a great day! lovely quilts, do hope they get there safely, I have a niece and her family who are missionaries in Pakistan and there it is very much luck if anything arrives. Thanks so much, Margaret! It seems recently, the packages have been arriving safe and sound so I hope it continues. Thanks for visiting and leaving a sweet comment! Have a great week! Oh my goodness! That castle is just adorable. They will love them. 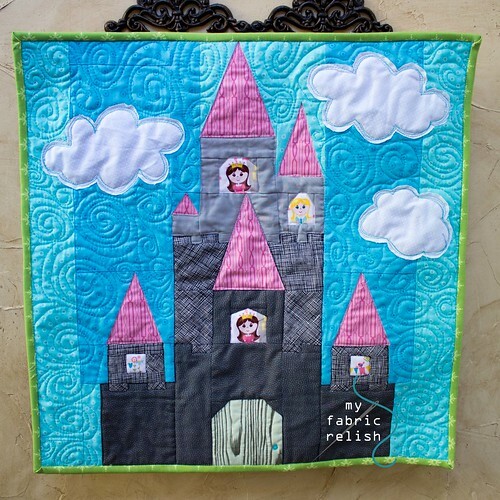 Amazing colors for your castle wall hanging---just too sweet for words! 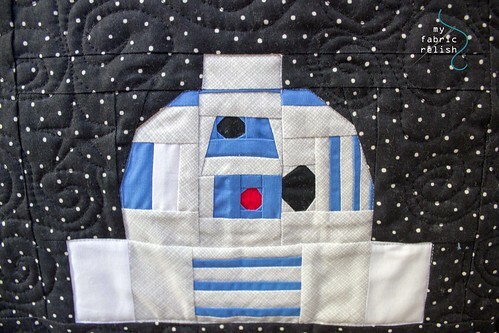 My almost 6 yr old son would be head over heels for the R2D2 quilt! LOVE your mini quilts - they are both adorable. Thanks so much, Laney! I hope they make it to India and they give them lots of snuggles! They are brilliant! I know my children would be completely in love with those!! I may have to add the R2D2 to my never ending list!!!! Thanks so much, Joanne! They were fun to create! I hope you give R2D2 a try! Or any of the other Star Wars for that matter. I have girls so it's nice to create for a boy now and then. Melissa, wonderful work which I think they will always treasure! Thanks so much Shanna! I hope so too! Both of your mini quilts are so beautiful! I love all of the quilting details you have added, and the clouds!! Thanks so much, Susie! I am so glad I added the clouds. I tend to talk myself out of adding extra frill because I'm ready to move on or just worried it wont look right...so glad I went with it! Thanks for visiting! Both your minis look fantastic! 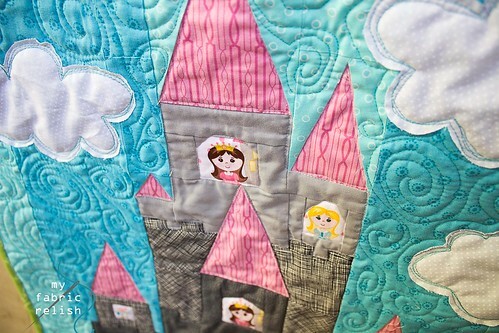 Love the quilting on them, and your fabric choices! Thanks so much, Kristy! 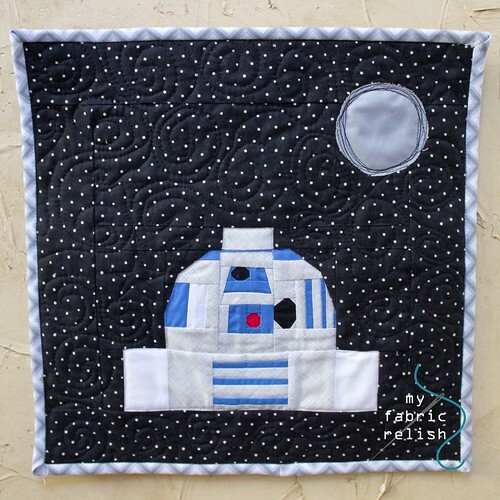 Thanks so much for hosting your fun link party every week and for sharing your awesome R2D2 pattern for FREE! so cute, Melissa! I'm certain that they will be loved!